November was a busy month for the project, and we're just catching up with sending out news of our latest round of events. The core team of Dave Pollard, Tree Bressen, Daniel Lindenberger and Sue Woehrlin convened once again in Eugene, Oregon—where we've met many times for work sessions over the past six years as it's the home of Tree, our project founder—and indeed, our "corporate headquarters" for business purposes. But as Tree had been increasingly pointing out, we'd never done a public workshop in Eugene! … so we figured it was past time to right this situation. The energizing intensive launched Friday night, November 16th, with a rousing Group Works “Games night” at Tree's, preceded by a delicious potluck. Dave, game designer and gamemaster extraordinaire, led some 15 of us through multiple rounds of play at three game tables. In and amidst the play, laughter, learning, some serious consultative help and community building, refinements were made to some games, even as other new games were envisioned. While we've incorporated Group Works games as educational components of public workshops a number of times in the past, this was our first try at a whole event just comprised of games, and the feedback was a resounding thumbs up. OK, so perhaps not every social circle would have been so open to having fun on a weekend night playing with notions of good group dynamics, but if you have some process oriented friends and associates, give it a try! Certainly Group Works games are a great way to introduce reflection on groups in a more playful manner in your facilitation or training work. Calling facilitators, project and group leaders, nonprofit board members, committee chairs, public engagement practitioners, teachers, organizers, personal coaches, activists, anti-oppression trainers, and others whose work involves empowering people to participate in groups, workplaces, and communities in a more dynamic and effective way . . . There were so many highlights from our trip. Sue and Tree have expressed a lot of the learnings beautifully, so for now I thought I would just share a snapshot from a great conversation. During our Friday "Deepening Facilitation" workshop it turned out that the two other folks I was sitting with were also Jungians. We got to talking about the relationship between Jung's description of the structural nature of archetypes and how it paralleled Crowley's description of the underlying nature of Tarot and my experience with Group Works. I won't give a full schpiel on the archetypes, but will say that Jung considered them to emerge from the collision of fundamental and inherited organizing principles in the mind on the one hand and experiences on the other: it's not that the "Mother" archetype would fully appear garbed in the rich imagery and symbolism in a vacuum, but rather than our minds have core organizational structures that will inevitably channel a host of our experiences in a way that takes on a familiar pattern as the Mother Archetype. (parallel to the way random points created based on probability distributions will form beautiful, complex and infinite patterns in IFS fractals (http://vlab.infotech.monash.edu.au/simulations/fractals/ifs-fractals/)). Similarly, Crowley talked about the way that Tarot cards came alive the more you used them - the more your personal experiences were associated with the cards, the more the underlying structure represented by a given card would get fleshed out. The Group Pattern Language Project has just returned from our first ever 'field trip'-- and what an adventure it was! Three core team members-- Daniel Lindenberger, Tree Bressen and Sue Woehrlin-- spent five days in Calgary, Alberta learning new ways that Group Works can be used to support large scale organizational change. Over the last year we'd been hearing rumors that over 6,000 City employees, and a couple thousand more citizens had had their hands on Group Works cards, and we'd certainly noticed a geographical concentration of deck sales in the area, so we decided we just had to go see for ourselves what was happening in northern stampede country! Our hosts, teachers and collaborators for the week were 4 of the 5 team members who for the past two years have lead the City of Calgary's Cultural Transformation Project: Dave Plouffe (Engagement Lead), DJ Kelly (Strategy Lead), Beth Gignac (Lead and Culture Coach), and Ken Cameron (citizen 'raconteur'!). What a talented, committed and innovative bunch of change agents! We spent the first day interviewing them about how they initially incorporated Group Works into the daily life of their team: drawing a card a day for random guidance, using the deck to plan upcoming meetings and scope out phases and aspects of their big initiative. Indeed, one of the things that struck us most was the organic way team members had integrated the group pattern language into their thinking and speech. That is, even without the cards in sight, they would say things like: "Oh, let's follow the group energy here" or "Guess it's time to inform the group mind" or "The experts on tap for this session were..." It was so inspiring to see the group pattern language embodied so fully! 1. The new free download version of Group Works is posted at the website and ready for you to try out! This file has the new cards (with all the minor improvements mentioned in our last news item, including added category cards), properly formatted for easy printing 4 to a page, and file size has been reduced from 47 MB to less than 8 MB. Thanks to Christopher Allen who assisted our graphic designer Janelle Frazier with formatting for PDF. 2. New decks, website, and distributor. Since publication at the end of 2011 our decks have been capably distributed via mail by Paul Cienfuegos of 100fires.com, whose service has been appreciated by many of you. As Paul's rates have risen and we are committed to keeping the deck as accessible as possible, we are now using Wright Fulfillment of Ashland, Oregon. This changeover required us to build e-commerce functionality into our own website, so now when you place an order you will no longer go off to a different website. The old stock has sold out and current orders are being filled with the new printing. It's all looking very pretty, and we're hoping everything functions the way it should. Please send any feedback about your experience with these improvements to me (Tree). I've personally spent months managing the distribution changeover on the heels of the second printing, and want to make sure it meets expectations. At the same time, i am excited and relieved to turn my attention to other aspects of the Group Pattern Language Project, including continued spreading of the word and teaching workshops. The 4 of us on the core team (Sue, Daniel, Dave & myself) recently spent a few days meeting in person for the first time since fall. When we do that we like to send out an update so others of you can hear what's happening behind the scenes. While a bunch of our time gets spent dealing with the nitty-gritty of keeping the website and other functions flowing smoothly, we also enjoyed an evening conversation on complexity science and how it relates to pattern language, and did the personal reconnecting that is so important to keeping our project alive when we operate at a distance. Here is some recent news. new stock has 30% post-consumer recycled content as compared with 10% last time, and the booklet in new edition is 100% post-consumer. Beautiful new article on uses of this pattern language posted by Dave Pollard on his How to Save the World blog. See "10 Ways to Help Your People Shine." Four of us from the project—Daniel Lindenberger, Tree Bressen, Dave Pollard and I— took turns facilitating, sharing application stories, offering historical perspective on pattern languages and our project’s evolution, sitting in on small work/play sessions, and otherwise doing the back ground grunt work (registration, deck sales, preparing snacks and meals, and washing dishes and all) that enables a workshop to run smoothly. Can you believe that after this packed weekend the four of us-- Daniel Lindenberger, Dave Pollard, Tree Bressen and Sue Woehlin-- retreated to Eugene for a three and a half day work session?! We did, and despite only starting at 10 in the morning (a new/later norm for the group) we still managed to fit in an average of 10 working hours each day. In keeping with priorities identified at our June work session, one focus of our work revolved around continuing to “consolidate project systems.” This included reorganizing how we track priority projects, fine tuning individual task tracking, adopting a master list of ‘roles & responsibilities’ and assembling notes on ‘future dreams’ in one place. We also made progress consolidating what had been way too many different tech channels, including working out protocols for where to archive photos and videos and where & how to make these available on the website, and revising the master list of accounts and access passwords. Plans to migrate the pattern hi/lo mailing lists to Drupal (our website) were also drafted. Hereby announcing a Group Works team offering . . . since publishing the deck we've given public workshops in Seattle, Vancouver, & Berkeley, now it's time for PORTLAND! Are you sitting with a beautiful Group Works deck on your hands, wondering what to do with it? Do you want to geek out with other process people? Does diving deep into a new way of thinking about group dynamics that builds on your existing understanding and skills sound compelling? New to all this? What is Group Works? A new way of thinking about group dynamics and how to work with them effectively. A common vocabulary for facilitators and participants to use in exploring how to create and support fulfilling group sessions. A deck of 91 beautiful cards, available for $25 in print or download for free from www.groupworksdeck.org (also available for iPad and as an iPhone app). 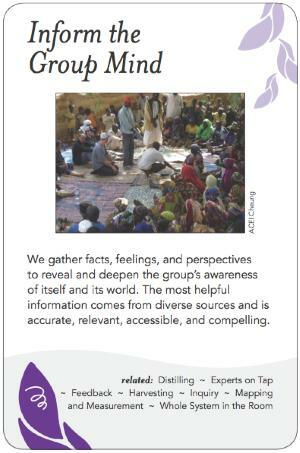 Each card describes one pattern that shows up in meetings or other group gatherings that have a sense of life in them. A nonprofit (technically called the Group Pattern Language Project) that collectively created and stewards this ongoing exploration, and that you can get connected with in a variety of ways. The purpose of the session was to hammer out our direction, priorities and strategies going forward, and streamline some of the tasks we have been doing to date. To remain open to emergent opportunities as the profession evolves and as new technologies and collaboration and application possibilities arise. We discussed a number of financial, contracting, funding and website management and organization matters, plans for future public events, and materials we could put on the website to support practitioners. We also discussed how we might attract more people to participate in the project in different ways -- which is essential if the vision we're evolving is to become a reality. We want to be able to offer a full spectrum of ways you can participate in the project: in informing and educating people about the Pattern Language and Group Works, in the development of additional tools and applications for the language, and in deepening the language. This weekend was our most ambitious set of workshop offerings yet for the Group Pattern Language Project. It was 2 full days of interactive presentations, with 5 of us co-presenting. Sue Woehrlin & i led off with an introductory workshop on a variety of ways to use the deck. While we are still developing more ways to actually use Group Works with groups in action, it's clear there are many applications in planning, studying, and debriefing group processes. And depending on how process-savvy or open groups are, it can also be brought in in other ways; for example, Daniel Lindenberger of Source is starting to use it with clients to define the essential aims and intentions for a session. After that, Dave Pollard led a skit on "How Not to Do Public Engagement," comprising 9 vignettes which the audience acted out, noted the problems of, and then called out which patterns from the deck could have made the situation go much better. For anyone with experience in public engagement, the skit struck humorously close to home, and was a reminder of just how far we have to go in making public meetings better. We are pleased to have the opportunity to present a 2-day Group Works workshop at the end of June in British Columbia. If you are curious about the deck and want to further explore how to use it, this is your chance! When: Saturday June 29, 9:00am-4:30pm, and Sunday June 30, 9:00am-4:00pm. Where: Quayside Village Co-housing, 510 Chesterfield Ave. at W. 5th Street in North Vancouver, near the Lower Lonsdale seabus dock. Upcoming Greater Vancouver area events! Planning is underway for a series of events in the greater Vancouver, B.C. area June 25th through July 1st. They will include a combination of public Group Works application workshops, professional development sessions for facilitators (perhaps around the therme of games possible with the deck?!) and project working sessions (likely on Bowen Island). Local planning is being coordinated by Dave Pollard and Daniel Lindenberger. Stay tuned for more details!